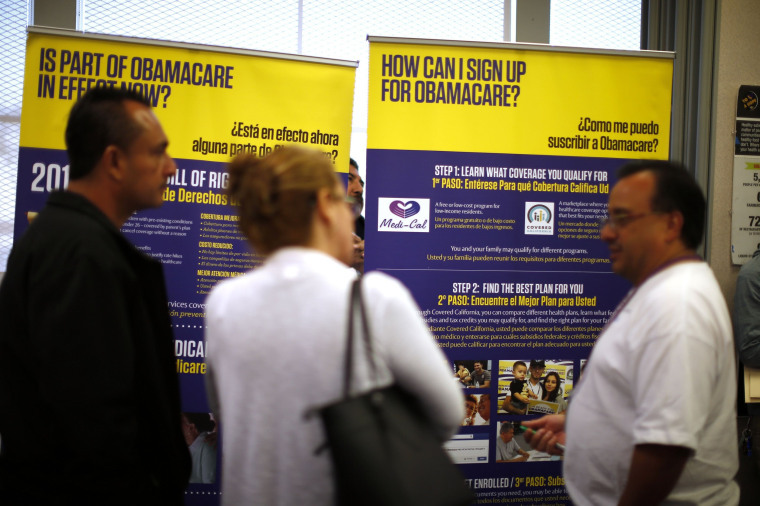 Experts estimate that 4 million people to drop their health insurance next year. Dana Farrell’s car insurance is due. So is her homeowner’s insurance — plus her property taxes. It’s also time to re-up her health coverage. But that’s where Farrell, a 54-year-old former social worker, is drawing the line. “I’ve been retired two years and my savings is gone. I’m at my wit’s end,” says the Murrieta, Calif., resident. So Farrell plans — reluctantly — to drop her health coverage next year because the Affordable Care Act tax penalty for not having insurance is going away. That penalty — which can reach thousands of dollars annually — was a key reason that Farrell, who considers herself healthy, kept her coverage. Farrell is among millions of people likely to dump their health insurance because of a provision in last year’s Republican tax bill that repeals the Obamacare tax penalty, starting in 2019, by zeroing out the fines. The Congressional Budget Office estimated that the repeal of the penalty would move 4 million people to drop their health insurance next year — or not buy it in the first place — and 13 million in 2027. Some people who hated Obamacare from the start will drop their coverage as a political statement. For people like Farrell, it’s simply an issue of affordability. Since Farrell started buying her own insurance through the open market in 2016, her monthly premium has swelled by about $200, she says, and she bears the entire cost of her premium because she doesn’t qualify for federal ACA tax credits. Next year, she says, her premium would have jumped to about $600 a month. Instead, she plans to pay cash for her doctor visits at about $80 a pop, and for any medications she might use — all the while praying that she doesn’t get into a car accident or have a medical emergency. “It’s a situation that a lot of people find themselves in,” says Miranda Dietz, lead author of a new study that projects how ending the penalty will affect California. People like Farrell whose incomes are too high to qualify for tax credits are especially vulnerable, says Dietz, a research and policy associate at the University of California-Berkeley Center for Labor Research and Education. They must pay the entire premium themselves. Up to 450,000 more Californians may be uninsured in 2020 as a result of the penalty ending, and up to 790,000 more by 2023, boosting the state’s uninsurance rate for residents under 65 to 12.9 percent, according to the study. The individual market would suffer the biggest losses. Covered California, the state health insurance exchange, predicts that enrollment in the individual market — both on and off the exchange — could drop by 12 percent next year, says agency spokesman James Scullary. Exchange officials also blame the end of the penalty for a 3.5 percent average increase in premiums, because the departure of some healthy people from the market will lead to a sicker and costlier insurance pool. Health insurance can be difficult to afford, but going without it is a “bad gamble,” Scullary says. Keep in mind: More than 22,000 Covered California enrollees broke, dislocated or sprained arms or shoulders in 2017, and 50,000 enrollees were either diagnosed with — or treated for — cancer, he explains. “We know that none of those people began the year thinking, ‘This is when I’m going to break my arm,’ or ‘This is the year I get cancer,’” he says. If you’re considering dropping your plan and risking the devastating financial consequences of an unexpected medical expense, check first to see if you can lower your premium. “A big mistake for people is to look at the notice they get for their current health insurance and see it’s going up a lot and then throw up their hands and decide they’re going to go without,” says Donna Rosato, a New York-based editor at Consumer Reports who covers health care cost issues. The most important thing to do is seek free help from a certified insurance agent or enrollment “navigator.” You can find local options by clicking on the “Find Help” tab on Covered California’s website, http://www.CoveredCA.com. Next, see if you can qualify for more financial aid. For instance, if your income is close to the threshold to qualify for tax credits through Covered California or another Obamacare insurance exchange — about $48,500 for an individual or $100,000 for a family of four this year — check with a financial professional about adjusting it, Rosato suggests. You might be able to contribute to an IRA, 401(k) or health savings account to lower the total, she says. Beyond that, be flexible and willing to switch plans, she advises. Consider different coverage levels, both on and off health insurance exchanges. If you’re in a silver-level plan (the second-lowest tier), you might save money by purchasing a less expensive bronze-level plan that has higher out-of-pocket costs but would protect you in case of a medical emergency. This year, Farrell got a clean bill of health from her doctor after a round of tests. She’s nervous about being without coverage next year, but feels she doesn’t have a choice. “It’s going to be the first time in my life I’m not going to have insurance,” she says.